We’ve finally reached the end of the road, and boy has it been quite a journey! Seems like just yesterday we were learning each other’s names and unpacking, but one thing’s for certain: there was never a dull moment with aydat (unit) Arayot! We hiked the highest mountains, lip-synced the craziest limericks, and were meltzarim (waiters) for the messiest meals! 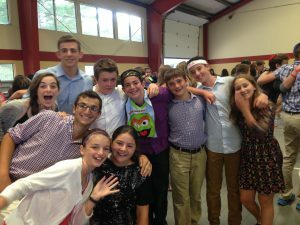 Though Maccabiah broke out last week, the camp yielded and came back together for a loud and ruach (spirit)-filled Shabbat! After havdallah, the camp resumed Maccabiah on Sunday with relay races and round-robin sports for everyone to enjoy! At night, we had our Camp Yavneh trademark”dizzy izzy” challenge, which entertained both the chanichim (campers) and madrichim (counselors). Yesterday, we had the Apache relay. It’s a gigantic race which involves every location and person at Machaneh Yavneh, and it was the closest race that camp has seen! This only brought more excitement to the end of the summer. Last night, we had chidon, our quiz-bowl competition which tests chanichim on what they learned in kitah (class). Today, we have our singing competition, lechu neranena (come, let us sing) and afterward, each plugat (team) will have a tekes (ceremony) and explain the meaning behind the ir shelet (painted artistic depiction of their team). Then, the winner of Maccabiah will be announced. Tomorrow, we will be packing and enjoying our banquet meal. Camp is almost over, but the fun never stops! Thank you so much for entrusting us with your children. We had a fantastic summer with them and we can’t wait until Levi’im 2016.